My first three trips to France came over the course of about five years and the length of each trip increased about five-fold from one to the next. First, one month with about 20 students for a Winterim term in Paris. Next, just six of us from the same university returned for the inaugural year of our school’s study-abroad program, a semester at the Université de Dijon. Then came my cooking school adventure, which I thought would be 9 months but became nearly 2 1/2 years, as a succession of work opportunities cropped up after graduation that bridged beautifully to extend my time. There was never a “heck, forget it, I’m never going home!” I always knew I’d go back to Seattle, but for the first couple of years I just wasn’t ready. I had more to do/see/learn/experience. I didn’t want to return feeling the adventure had been incomplete. At the same time, I didn’t want to go home for a visit. I was in the midst of a really transformative era, completely engrossed in the world of food, the culture of France, meeting fascinating people and learning new skills. I was feeling my life’s path and direction forming under my feet each day. I didn’t want to break that spell and dampen the magic by hitting the pause button. To do what? Head back to familiar territory for a plate of nachos and brunch with friends and then fly back to pick up where I left off? That just didn’t seem right. Since I was gone so long, some folks made the trip to see me, which was great. I’ve talked a bit about my mom’s visit one fall. My then-boyfriend-now-husband came to France to see me, which itself was a big tribute to our relationship, he was not a traveler back then. And my dad come once as well. I don’t think Dad and I had had a trip together, just the two of us, since Disneyland in 1980. I just loved my dad to bits, I was a classic “daddy’s little girl” and really enjoyed time spent with him. 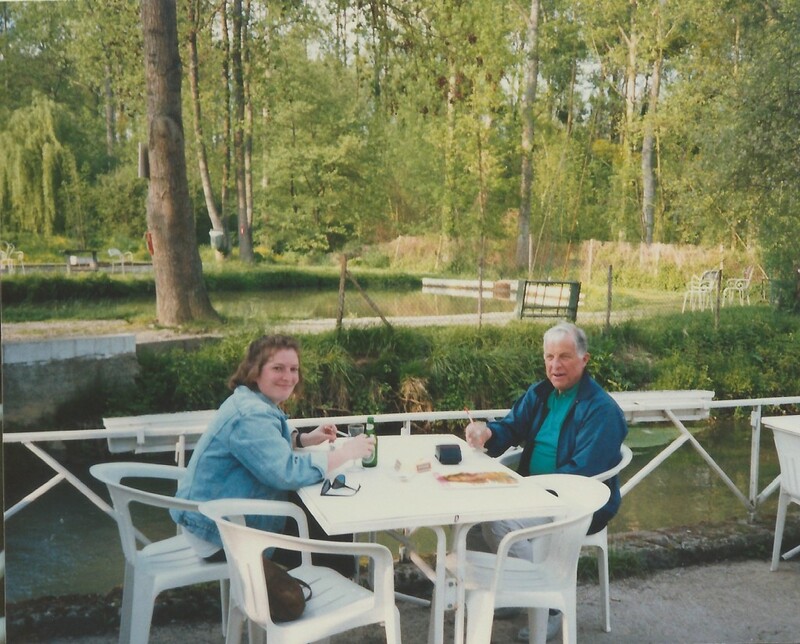 A good-natured, friendly, warm, loving man, it was a great joy to share my France with him (which is true of sharing it with anyone close to me). One thing my dad loved at the time was a white rum and tonic cocktail now and then. It’s a pretty basic thing, right? Any bar or restaurant with basic provisions back home can whip one up on demand. Today in Paris there is contemporary cocktail culture brewing, places like Prescription Cocktail Club and Candelaria and Bar Coq. But back then it wasn’t the case. (I recall the first Gulf War was underway when Dad came over, so was probably early 1990). A “cocktail” in a restaurant then might have been an aperitif type thing: a kir royale, Dubonnet on the rocks, possibly some Scotch poured into a glass. We did a lot of fun things together, played golf, visited with friends, he got to see my super tiny apartment in the Montmartre neighborhood, got propositioned by a “lady” in the Pigalle area (en route back to his hotel near my apartment). All in all a memorable trip and a phenomenal memory that helps me keep my dad close in the years since he passed. But that darn cocktail was elusive. It wasn’t until our return trip to Paris, after traveling around Burgundy, that we threw in the towel and headed to either the Ritz or the George V where we were assured of the kind of cocktail selection that would make granting his wish easy. It was an adventure, a splurge, a fun indulgence and it made him happy. Loved it. Being back here now? This extended time in Paris is helping me not only reconnect personally with the city, but retracing steps I’ve shared with others, it also helps me rekindle and appreciate moments shared with those I love. Who knows. Maybe I’ll find myself back at the George V before the end of this trip (the Ritz is closed for a major ginormous renovation). I’ll put on the one dress I packed, slip on those strappy low heels, hit the bar, order a martini (I really don’t care for rum) and toast my father. And my mother. And the lifetime of outstanding memories and experiences that are housed here in Paris.